One has to understand that “USDA Organic” is only a certification of a method of growing . It has nothing to do with the quality of the produce grown. Now you can test the quality of the produce you purchase from the store or the farmer’s market. The test equipment is portable and it is possible to test before you buy. That might cause some repercussions, we recommend you bring a sample of your Organic Tomatoes to the Sustainable Living Center and get a free High Quality Nutrient Test. The world is awash in a sea of misinformation about organic foods. For instance, any search of the Internet reveals never-ending comments and arguments about “proper diet.” If you monitor many such discussions it becomes immediately obvious that the participants, whether they are physicians, chiropractors, nutritionists, farmers, veterinarians, or laymen, cannot document what they discuss. Plants grown with probiotics like bokashi can be shown to have higher levels of mineral density using a BRIX meter. Higher mineral density is correlated with plant health and overall flavor. The probiotics help break down the rocks and minerals in order to deliver humic to the plants. In a synthetic system, plants often cannot absorb all essential minerals it needs to grow. By using bokashi, you are essentially giving the plant what it needs to feed a healthy and strong human being. The plant will have, in its soil, everything it needs to live symbiotically with the earth. The bacteria and fungi, are equipped with the bokashi which was specially formulated to keep the microbes alive and flourishing. The goal is to grow a plant that will provide the essential minerals flavors to the farmer at the end of the run. Tomato quality correlates to the amount of dissolved solids in plant sap (juice). All you need are the right tools and you will not be fooled into buying low quality produce again. 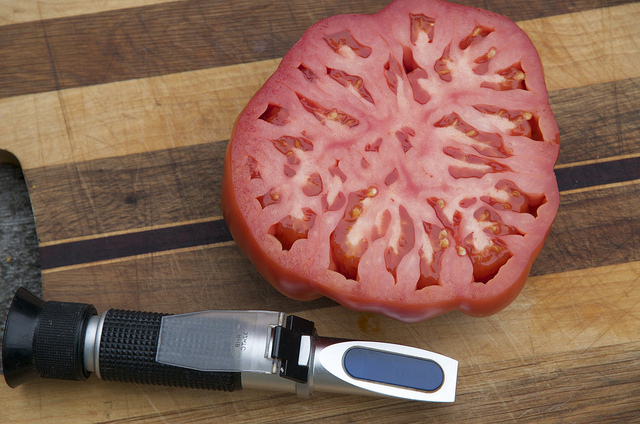 The right tool is a refractometer that determines a Brix Value which indicates the quality of the fruit or vegetable. 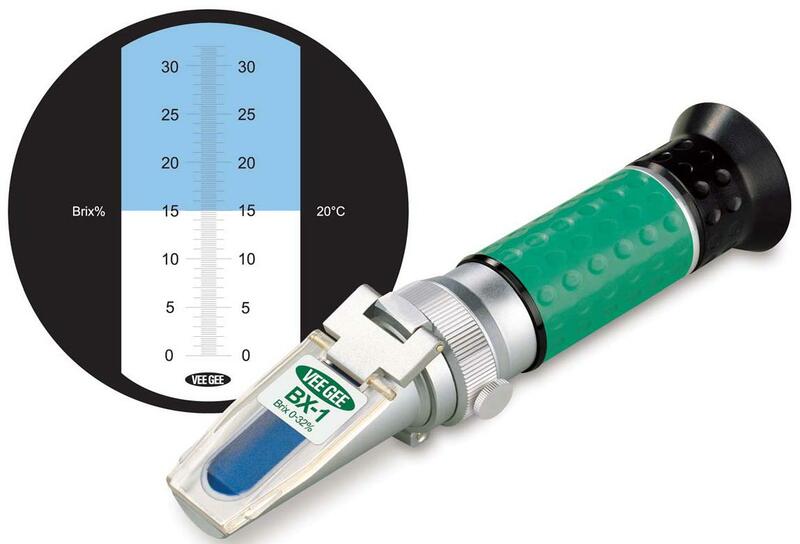 Refractometer is the instrument used to obtain a Brix value. This simple, hand-held device measures the amount of refraction (or bend) in a beam of light that passes through the plant sap. It is portable unit is a handheld and simple to operate. When you peer down a long hollow tube at the prism part of the light beam passes through the thin film of plant sap on the prism, while the rest bypasses this specimen. A scale in the viewfinder allows you to easily identify the Brix value. What plant part is used? Whatever part you eat, if it is ripe. If it is not ripe, take the most mature leaves. 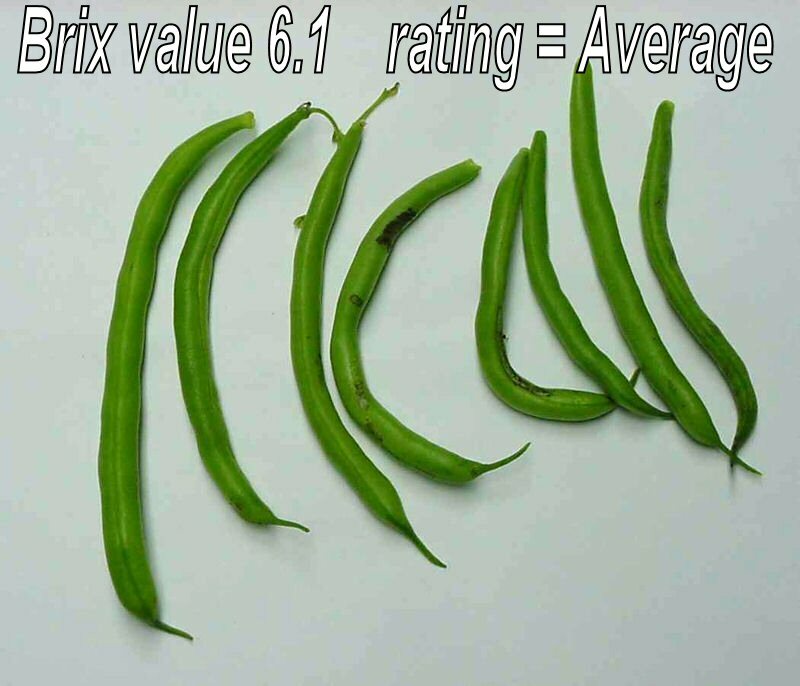 Within a given species of plant, the crop with the higher refractive index will have a higher sugar content, higher mineral content, higher protein content and a greater specific gravity or density. This adds up to sweeter tasting, nutritious food with lower nitrate and water content, lower freezing point, and better storage attributes. 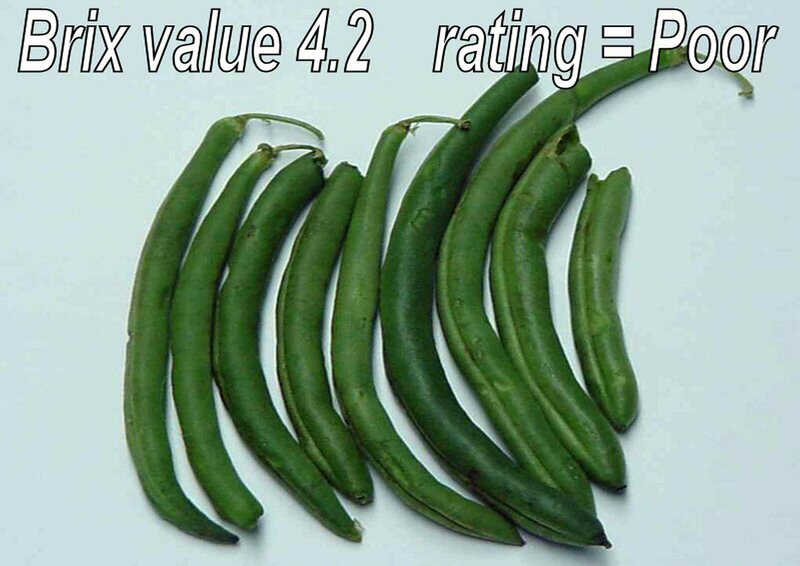 Two (2) samples of fresh green beans were analyzed by a refractometer and a professional scientific lab. When 100 grams (about 3 ½ oz.) were analyzed in a professional scientific lab. Free High Quality Nutrient Testing are given at the Sustainable Living Center at scheduled times. Call 541-996-3671 for the next available test dates. What are the Nutrients Value of your Organic Tomatoes? This entry was posted on October 29, 2015 by Kayak Rentals & Sustainable Living.